CWDM XFPs (10G Small Form-factor Pluggable) are compact optical transceiver modules used in communications over fiber optic cables and are designed to support SONET/SDH, 10 Gigabit Ethernet, and 8G Fiber Channel communication standards over Plexstar DWDM products. 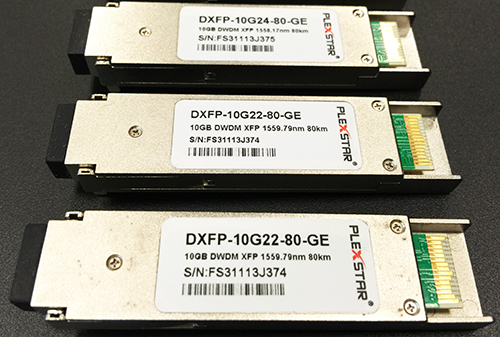 Plexstar also manufactures compatible XFP transceivers which can be alternatives to those branded by Cisco, HP, and Juniper etc. All XFPs are available for 20, 40, 60 and 80 km fiber length and data rate up to 10G. Data-rate up to 10 Gbps. Distance: 20, 40, 60, 80 km.